Peter Langkjær Madsen (Danish: [ˈpeːˀdɐ ˈlɑŋkæɐ̯ ˈmæsn̩]; born 12 January 1971) is a Danish former entrepreneur and self-taught engineer. He co-founded the non-profit organization Copenhagen Suborbitals and was the founder and CEO of RML Spacelab ApS. In April 2018, Madsen was convicted of the 2017 murder of Swedish journalist Kim Wall on board his submarine UC3 Nautilus and sentenced to life imprisonment. ↑ "Peter Madsen, inventeur exalté et mégalo". FranceSoir (in French). 24 August 2017. Retrieved 24 August 2017. ↑ "Danish inventor Peter Madsen sentenced to life in prison for murder of Swedish journalist Kim Wall". Associated Press. 2018-04-25. Retrieved 2018-04-26. 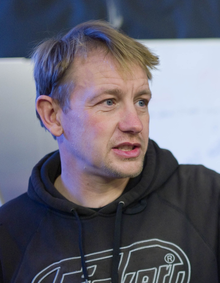 ↑ "Danish engineer Peter Madsen sentenced to life for murdering journalist Kim Wall". The Guardian. 2018-04-25. Retrieved 2018-04-26. ↑ "UC3 Nautilus Homepage". uc3nautilus.dk. Archived from the original on 5 March 2010. Retrieved 9 February 2010. ↑ "Inventor Madsen guilty of Kim Wall murder". BBC News. 25 April 2018. Retrieved 25 April 2018.